Dear collaborators, it is an honor to share with you the news, that this year in 2016 we are celebrating 20 years of working with humpback whales! The results have been diverse, and what started as just a project researching the whales, today has developed to encompass various areas of work including conservation, environmental education and sharing of information. Of course we want to take this opportunity to express our sincerest appreciation to all our collaborators, donors and volunteers who have been continuously part of these glorious years of work, without you none of this would have been possible. 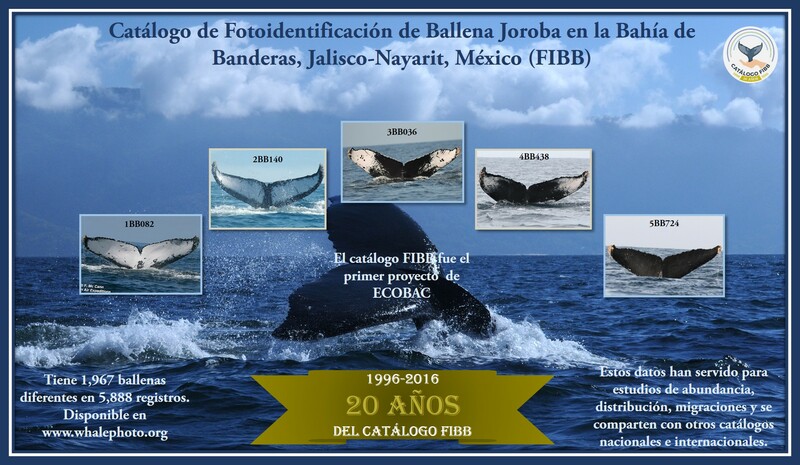 In the year 1996, after years of working with the “Mexican National Catalog of Humpback Whales” of the Autonomous National University of Mexico (UNAM), the idea arose to start a humpback whale catalog for just the Bay of Banderas. 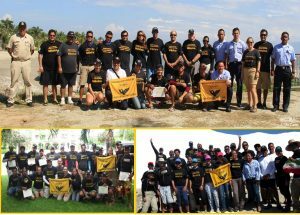 We began by inviting different institutions, tour operators and photographers to be part of the dedicated work. 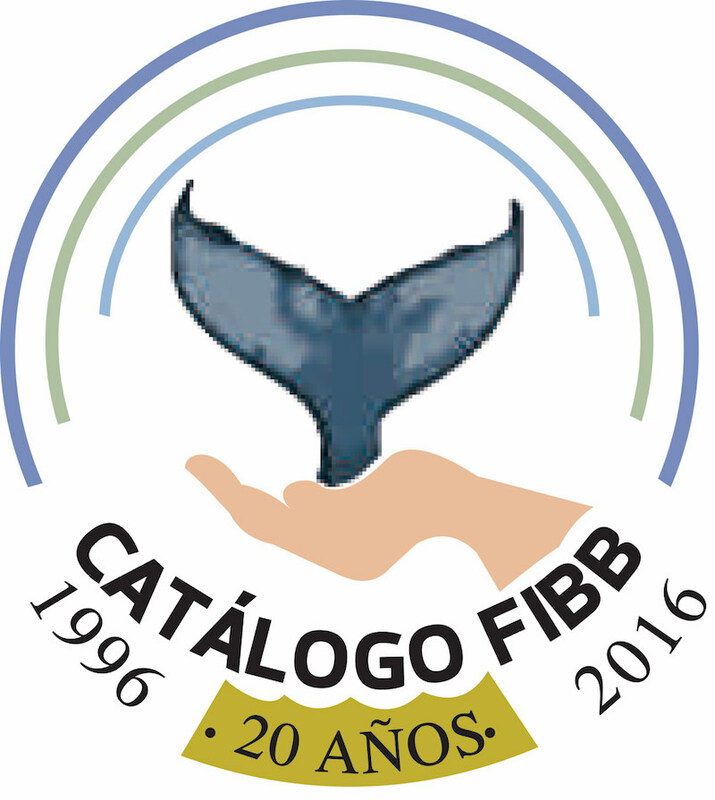 The FIBB catalog includes independent collaborators and a diverse group of organizations, such as the Regional Centre of Fisheries Investigation-INP, Cruz de Huanacaxtle, Cielo Abierto, Discover Pacific Tours, Ecotours de Mexico, Technological Institute of the Bay of Banderas, Nicola Ransome, Ocean Friendly, Thalia Martinez, Vallarta Adventures and Whale Watch Vallarta. To date, the catalog contains 1,967 individual whales that are classified into 5 different categories, according to the color patterns of their tail flukes. Using data from the catalog, a great variety of other types of work have been produced, including thesis projects, investigation articles, international participation and presentations in national and international conferences, and preparation of symposiums, amongst other things! As part of the celebrations organized by the Punta de Mita Foundation (Fundación Punta de Mita) to commemorate “Earth Day”, ECOBAC and other institutions were invited to contribute and take part in the activities. ECOBAC presented a talk entitled “The humpback whale and other cetaceans of the Bay”, which was attended by children from the local secondary school who seemed very interested to learn about the majestic cetaceans, and have their photo taken with “Kuikani”, our life-sized humpback whale calf. Additionally, we shared presentations about the marine environment, and the event finished with a litter collection/beach cleanup, all organized by the Punta de Mita Foundation (Fundación Punta de Mita). To us at ECOBAC it is particularly important and enjoyable to participate in activities that involve children and young people, who always seem to quickly become great supporters of our causes. 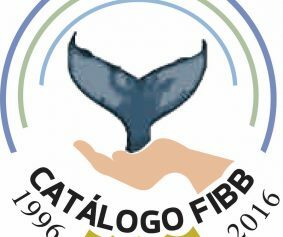 On the 20th anniversary of the Photo Identification Catalog of the Bay of Banderas (FIBB Catalog) we have analyzed exactly 1,967 different registered tail flukes. These results were presented in a poster at the XXXV International Meeting for the Study of Marine Mammals (SOMMEMA in La Paz, Baja California), with the title “Photo-identification of humpback whales: Is it true that fluke coloration does not change over time?” The work involved comparing the re-sightings of whales recorded in our catalog; and then to assess possible changes in the pigmentation patterns, marks, scratches or scars, that in some cases can make a whale appear to be very different. So, what were our findings? Effectively, we found that the features of a tail fluke that make a whale unique do change over the years, and that it is possible that a whale can appear completely different as time passes. The technique of photo-identification of humpback whales is based around the idea that the ventral side of the caudal fin (fluke) of the humpback whale is like a fingerprint, that doesn’t change significantly over time, apart from acquired scars. However, our results show that the fluke is more similar to a face, and acquires marks and scars and may even change in color over time. The presentation was a success, and was well received with a lot of interest shown from attendees of the conference. 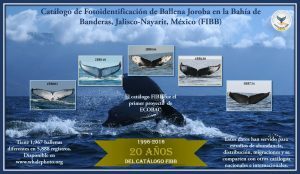 Another subject presented by ECOBAC in the XXXV International Meeting for the Study of Marine Mammals (SOMMEMA in La Paz, Baja California) was: “The humpback whale (Megaptera novaeangliae) in the Bay of Banderas, Mexico: Analysis of the relative abundance and temporal variation during the winters 2004 – 2014”. In the analysis of the 11 seasons, an increase in the number of whales was observed, as well as a change in the peak of the season (days when more whales are seen). During the 1990s, the peak of the season was during the last two weeks of January and the first two weeks of February; more recently a change has been observed, with the peak of the season now occuring during the last two weeks of December and the first two weeks of Janaury. 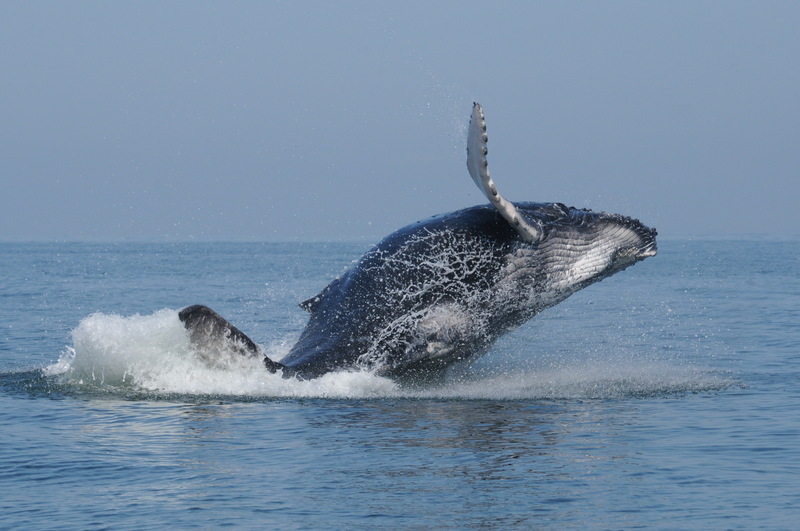 Even though these are very positive results and findings for the humpback whale population, we will not stop or reduce our efforts in monitoring and regulating the activity of whale watching and preventing accidents; it is the continuation of these programs that contributes to making the bay an ideal place for humpback. 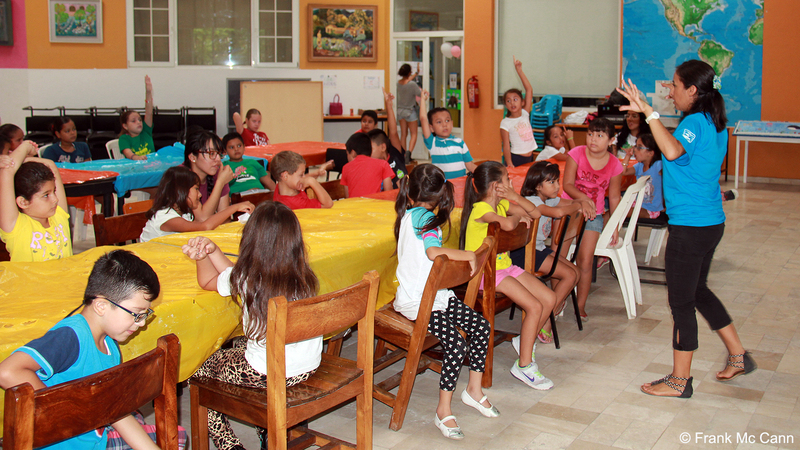 Enjoying the summer activities in the library of Los Mango s (Puerto Vallarta), ECOBAC was invited to collaborate with some activities for children from the local primary school. It was run in the morning, and in an entertaining and interactive way we talked about the general characteristics of cetaceans and the life cycles of whales. 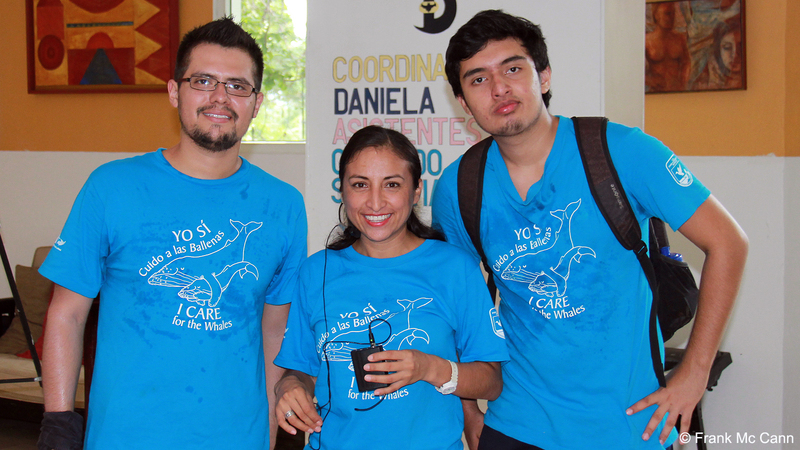 Of course, the most important subject we talked about was how to help care for and protect the whales, in the childrens’ daily activities at home, in school and in the whales’ natural environment. To reinforce the message, at the end of the talk we played a marine “lottery”. The winners of every round received the present of the game “Zoomergidos” and “Anchors and Lifejackets”; we are sure that by playing the games the, children will go away to learn and share with their friends and families the idea of how to look after the whales! Fishing is recognized as one of the coastal activities with the greatest increasing global demands, and also an activity that is indispensible for the human race in many parts of the world. However, fisheries practices have brought many problems for marine animals, as often fishing gear not only catches it’s target species but also other wildlife “by-catch” such as turtles, dolphins, sharks, rays and even whales. By-catch of turtles and dolphins is already being reduced by the Mexican governments official regulations, with some fishing methods and equipment banned or controlled in order not to affect vulnerable populations. 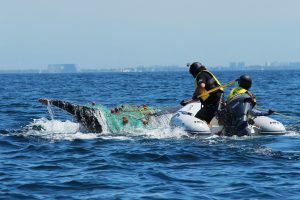 However, the problem with whales continues; documentation work carried out by RABEN during disentanglements is essential to understand the types of fishing gear that are entangling whales, and thereby enabling authorities to establish mechanisms for exclusion or easy release of whales from fishing gear. 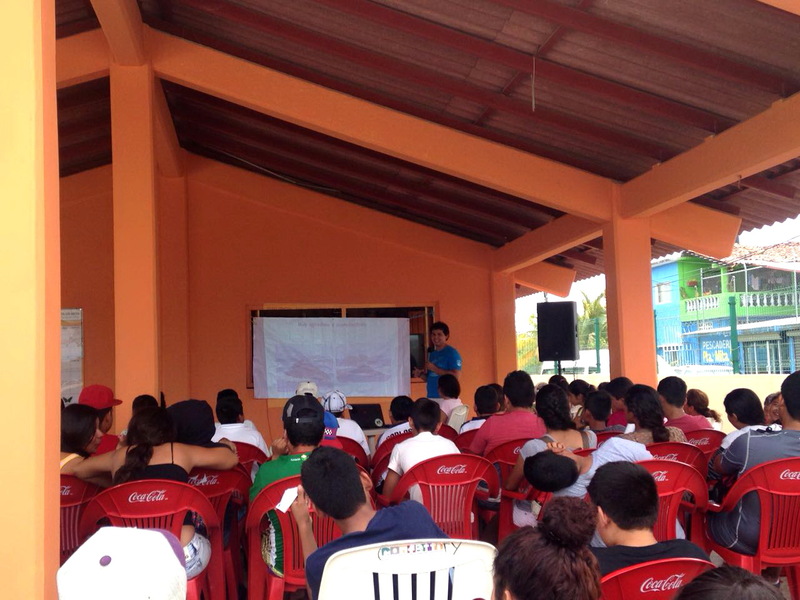 Thanks to the “VIII Scientific Forum of Ribereña Fisheries” which took place in Puerto Vallarta, the project “In search of a solution to prevent by-catch of large whales in fisheries gear: Mexican National Whale Disentanglement Network (Red de Asistencia a Ballenas Enmalladas or RABEN)” was presented. 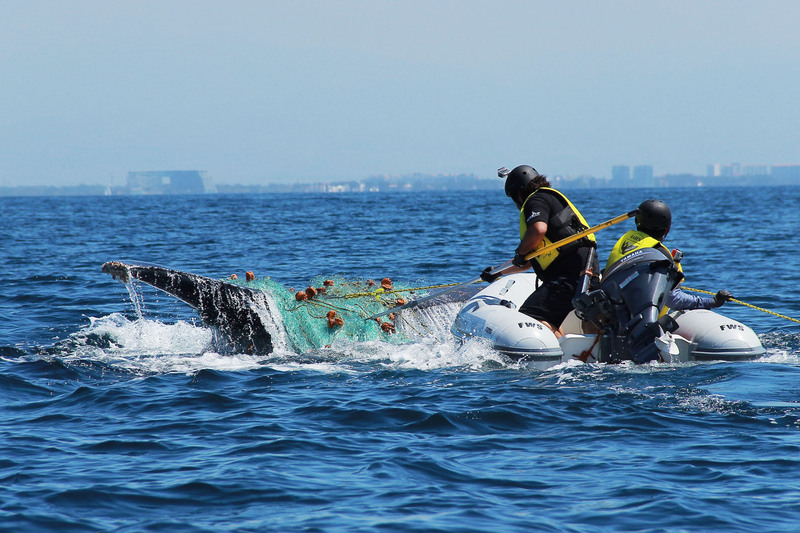 The aim was to introduce the idea to those engaged in fisheries research, to reach agreements in the future, and to discuss and find technical and legally accepted mechanisms to prevent by-catch of whales. Lastly, but no less importantly, we are pleased to share that during the month of November, Puerto Vallarta will become the headquarters for the 4th International Conference on Marine Mammal Protected Areas, promoted and organized by ICMMPA (International Committee on Marine Mammal Protected Areas), CONANP and ECOBAC, amongst others. One of the objectives of the congress will be to share information on the approaches that have been used in protected areas, as well as to search for new planning strategies for the management and monitoring of natural marine mammals protected areas, especially as this year’s theme will be “Building partnerships and planning for conservation”. During the conference the results obtained by RABEN will be presented, and to end the ICMMPA conference there will be the first national meeting of all the RABEN teams, where they will share experiences and successes.